Silver Sceen Machines, the Scooby Do van in three versions, The Penguinmobile (one of the Batman’s arch enemies, and the Ecto 1 from Ghostbusters. Versions A & B are regular issues and will be $23.99 each. The iWheels editions are randomly packed and I do not know which, if any, will be in the boxes I have ordered. All these cars are have the 4 Gear chassis. Hot Rod Magazine cars. There are two versions of each car. All cars are $21.99 each. The cars are Vega Pro Stocker, 1966 Nova, 1969/70 Mustang, 1968 Cougar, 1960’s Camaro, 1970 Chevelle. The cars will be on the Thunderjet 500 Chassis with traction magnet. 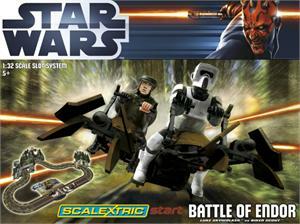 Weave your way through the trees on your speeder bike on the decorated forest track and duck through the woodland card accessories depicting the famous scene from “Return of the Jedi.” Choose the rebel army and race Luke Skywalker or join the dark side and fly with the imperial army with the Scout Trooper on the precisely detailed speeder bikes. Use the force and you will win with this set. The Super Sport version is the fastest road-legal production car in the world, with a top speed of 431 km/h (268mph). The original version has a top speed of 408km/h (253.52 mph). It was named Car of the Decade (2000-2009) by the BBC television program Top Gear. The car is named after the French racing driver Pierre Veyron, who won the 24 hours of Le Man in 1939 while racing for the original Bugatti company. This is a non-catalog set with an extended figure eight layout. This set will be available at the end of the month! 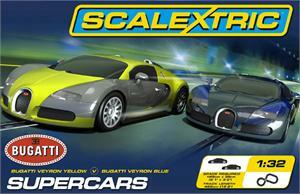 With the Digital Race Line you can race up to 4 cars on two lanes using the Scalextric Digital powerbase that comes in this set. Overtake your opponent or change lanes with the touch of a button on the two digital lane change pieces on this challenging high-speed GT circuit. The Jaguar XKRs are super resistant cars featuring exciting race liveries. This set will be available mid-August! The oval circuit of the Pit Stop Challenge is harder than it looks! This race set is not only about speed, but strategy and skill. 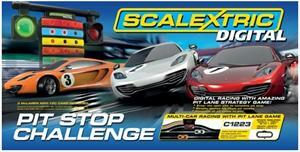 Included is the Digital Pit Lane Game; be the first one to complete the pit stops required to win the game. Beware of entering the pit lane when the light isn’t green and you will receive a penalty! There are three numbered McLaren MP4-12Cs, but allows up to four racers. This set will be available at the end of the month! Star Wars Sets Available Mid-August! 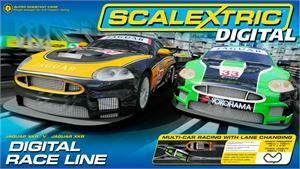 Scalextric produces a new way to play with slot cars. Instead of the standard race game, the “Death Star Attack” is all about knocking your opponent off the track! This pursuit game provides two different starting points on the layout; the spaceships try to catch up to the enemy for a downright battle! Speeding around the glow-in-the-dark track and through the Death Star, the box the set comes in transforms into part of the adventure. A fight to the death, which will bring a smile to the victor’s face.